At last a thoroughly engineered and highly effective bolt-on solution for adventure travellers who demand maximum convenience when travelling with bicycles on their Jayco Adventurer caravans and pop-tops. 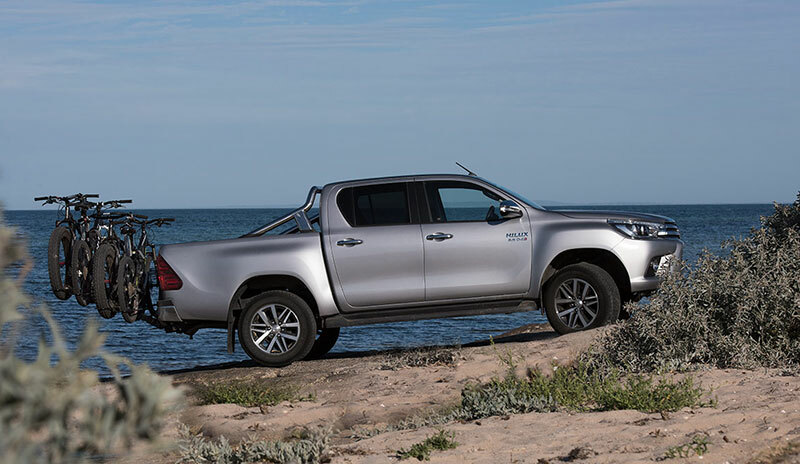 Traditionally the iSi Extreme Duty bicycle carrier is specified by the big hitters in the off-road trailer market and now this bicycle carrier is available to all Jayco Adventurer owners - with the added bonus to swap the bicycle carrier between the front of the caravan and the back of the car and 4WD. The heart of the bicycle carrier drawbar mount for the Jayco chassis is the iSi K-Mount. A practical and super strong mount that bolts directly onto the Jayco A-Frame. This iSi K-Mount delivers a very wide and very long footprint in order to spread the load and eliminate pressure hot spots on the drawbar chassis rails. This totally eliminates the high point loads that result from narrow welded mounts. Moreover, the iSi K-mount clears the jockey wheel and gas bottles and is compatible with most weight distribution systems and stone guards. Retained with four high strength galvanised U-Bolts with tough 8mm thick plates and double-nut lock, this solid mount delivers peace of mind so that you can concentrate fully on the road and tracks ahead. 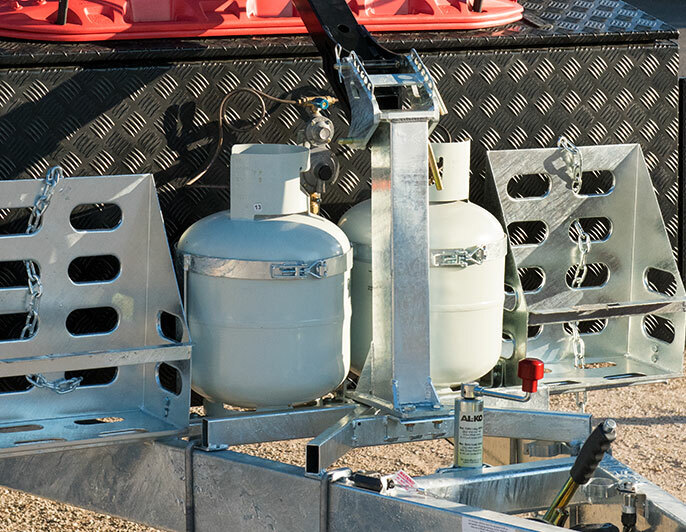 Designed specifically to clear jerry cans, jockey wheels and gas bottles, the wide footprint of the iSi K-Mount delivers a highly effective platform to support up to four bicycles for zero hassle travel over the harshest terrain. Pivot all the way over to flat in order to have unhindered access to the front storage box and gas bottles. The maximum convenience for zero hassle travel with bicycles all Jayco Adventurer models. By staggering the bicycles vertically, typical clearance issues such as crank to crank and hub to hub are eliminated so the entire load is made very compact. This results in the greatest clearance possible from the tow point. Moreover, the iSi bicycle carrier is designed to allow the operator to load bicycles exactly side by side and eliminate the need to push bikes left and right in order to have them fit together. 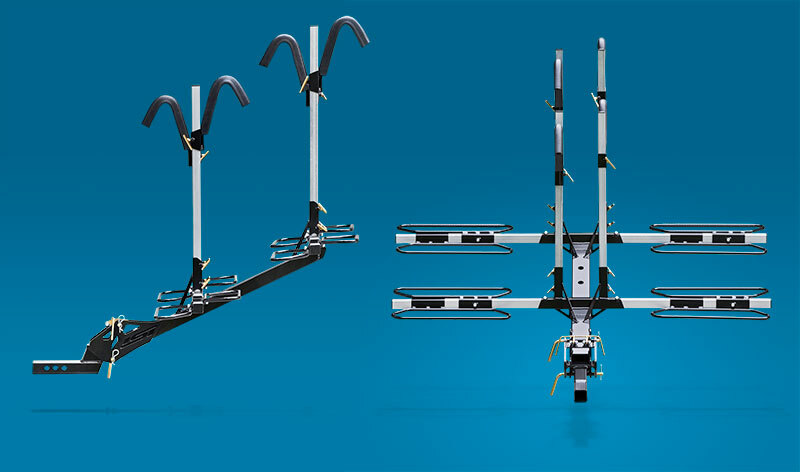 This further enhances trailer articulation by delivering a very narrow load and allows iSi to deliver a drawbar mounted 4-bicycle solution on all Adventurer caravans and pop-tops. Swap the carrier between the trailer and the car quickly and easily. 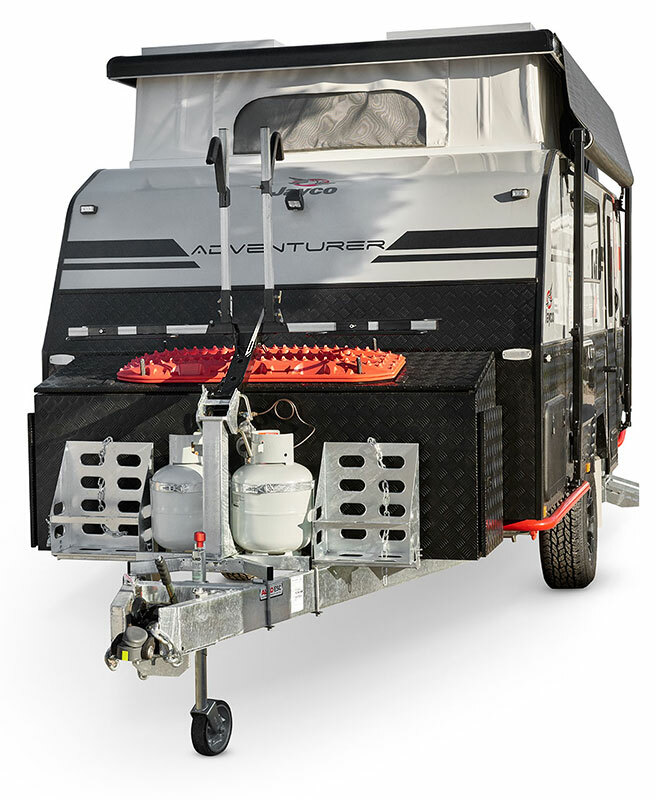 It's great to base camp with the trailer and move the carrier to the car and explore areas that may not be appropriate to drag the Adventurer through. When you have the flexibility you use it to make the most of each trip and because we make it easy to swap, you don't go looking for excuses to leave the bikes alone.